Want to enjoy a cold beer, but can't find your bottle popper? 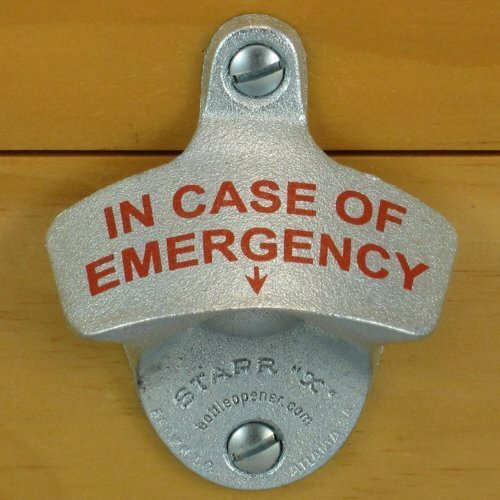 Solve that emergency forever with this wall mounted bottle opener! This heavy-duty zinc alloy bottle opener comes with mounting screws so you'll have it hanging in no time flat. It reads "In Case of Emergency" because let's face it you want your beer opened right now! Order your wall mounted bottle opener today and you'll always know where to pop your beer! * Specs - Dimensions: 2 1/2"W x 3 1/4"H. * Includes - Mounting Screws. View More In Corkscrews & Openers. If you have any questions about this product by Starr X, contact us by completing and submitting the form below. If you are looking for a specif part number, please include it with your message.